This item is 3 years and 1 month old; some content may no longer be current. This report provides an update on the use of oxycodone over the 12 month period from October, 2014 – September, 2015. Encouraging the appropriate use of oxycodone has been a key focus for bpacnz over the past five years. Despite a recent decrease in the number of patients receiving oxycodone in New Zealand, there is still a large number of patients who are prescribed it each year. General practitioners are encouraged to continue to critically review the conditions for, and appropriateness of, oxycodone prescribing in their patient population. Oxycodone is a strong opioid analgesic that should be used as a second-line treatment for patients who are not able to tolerate morphine as it does not provide more effective pain relief than morphine, is more expensive, and is associated with increasing levels of misuse. Ideally, oxycodone should only be used in patients who do not tolerate morphine. However, in the last 12 months 86% of New Zealand patients dispensed oxycodone in the community did not have a prior prescription for morphine. The majority of these prescriptions (75%) were initiated in secondary care. General practitioners are well-placed to review any indications for oxycodone prescribing, even if it has been initiated in secondary care, due to their knowledge of a patient’s clinical history and psychosocial background. Overall the use of oxycodone has decreased. At its peak in 2012, 13,986 patients in a three month period received an oxycodone dispensing compared to 10,679 patients in a three month period during 2015. The use of oxycodone varies across the country. 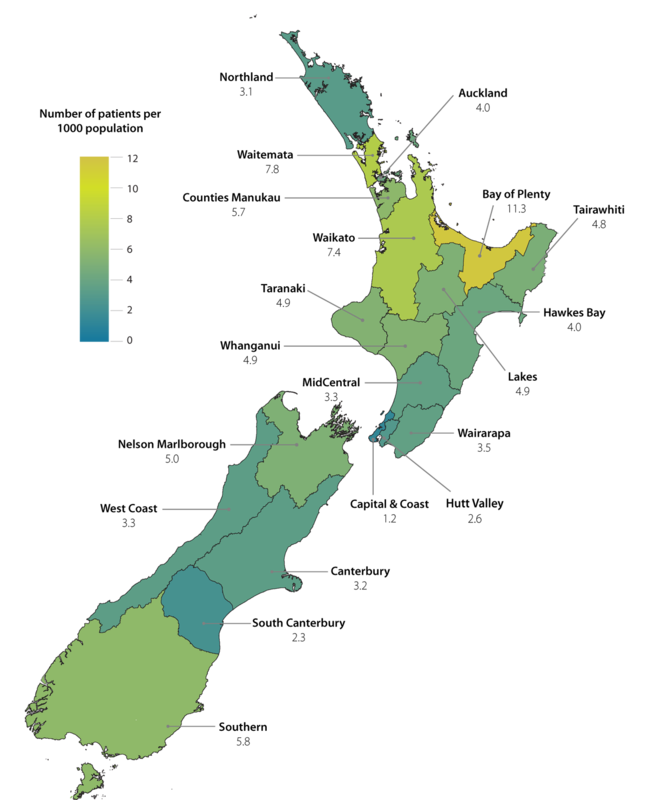 The map on the right shows the number of patients per 1000 population in each DHB who had an oxycodone prescription dispensed between October, 2014 and September, 2015. Some DHBs are running safe opioid prescribing programmes, for example, the Capital & Coast DHB Integrated Care Collaborative Programme ( ICC); this has seen a reduction in the prescribing of oxycodone through the use of prescribing guidelines, education and audits. Contact your DHB for information on any local initiatives. “Oxycodone: how did we get here and how do we fix it?”, BPJ 62 (Jul, 2014). Available at www.bpac.org.nz (Accessed Feb, 2016). “A disaster in the making”: it’s time to take action against misuse of oxycodone”, BPJ 61 (Jun, 2014). Available at www.bpac.org.nz (Accessed Feb, 2016). “Oxycodone for non-cancer pain’”. Best Practice Audit. Available at www.bpac.org.nz (Accessed Feb, 2016). Brian Ross said: 4/03/2016 5:34:59 p.m.
the pattern of use from hospital services post orthopaedic services has not changed in the last year ie 2015 , the predominant medication that we have from them is oxycodone or at times tramadol until this changes we in primary care are unable to change the statistics' at all. And now with the egfr being used more than ever as a predictor of problems , there is a reluctance to use morphine at all especially in the aged group of post fracture NOF etc. .
Indira Edwards said: 28/01/2018 6:52:01 p.m. This article is 3 years and 1 month old.